I was doing my rounds at school the other day. 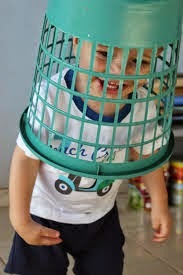 A young student (7 years old) had a waste paper bin over his head. This sounds a bit like the intro of a joke (I went to the doctor the other day...). Anyway I spoke to the student and he told me he did this because 'I'm rubbish and that's where I belong.' On other occasions he had said to me that he was bad/naughty. This kind of talk would suggest to me (as a Rational Emotive Behaviour Educator) that the child has constructed a view of himself that is irrational and therefore self defeating. Somehow he has concluded that he has no worth ('I'm rubbish') which is reflected in his poor behaviour and in the tears he shed's when we talk about this. So how do we help this sad (depressed?) young person mend his breaking (broken?) spirit? Albert Ellis said 'the future of psychology and psychotherapy is in the school system' but 'the future' is yet to arrive it would seem. Educationalists and academics would do well to consider what is happening on its 'own doorstep' here in south Australia. Many schools are using Rational Emotive Behaviour Education to help students understand how their thinking, feeling and behaviour are linked. Rubbish is what has been discarded because it has no use (not worth anything) and our young student may have decided that he is of no use. Why has he arrived at this conclusion? If this is his reality where might it lead him? This young person could do with a daily dose of USA teaching (Unconditional Self Acceptance) where he can be left in no doubt that his worth is not tethered to the views of others or how well or badly he may perform at a task. Rational Emotive Behaviour Education is about doing this and there are many schools applying REBT principles in daily practise across all year levels. Students of all ages can live happier and healthier lives if they understand how as constructivists their habits of believing are connected to how they feel and how they behave. Their lives may depend on it!